We’d love your help. 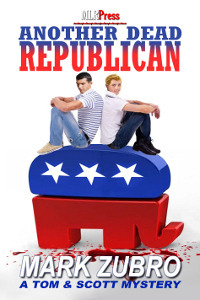 Let us know what’s wrong with this preview of Another Dead Republican by Mark Zubro. To ask other readers questions about Another Dead Republican, please sign up. Good gay mystery in which Tom and Scott head to Wisconsin to support Tom's sister after her loathsome husband was murdered during a gubernatorial recall election. A titch more editing would have helped on this one. We know the bad people are bad because they are ugly. Very, very ugly. Like, thirteen-year-old-girl-describing-the-mean-girls-at-school-in-her-sooper-sekrit-very-very-serious-diary ugly. We know that the good people are good because they are good. Very, very good. Like, shitting-rainbows-and-leaving-trails-of-daisies-everywhere-their-feet-touch-the-ground good. No shading. No subtlety. No interest. In all cases, the characters are little more than caricatures. The bad guys have tantrums and lie an We know the bad people are bad because they are ugly. Very, very ugly. Like, thirteen-year-old-girl-describing-the-mean-girls-at-school-in-her-sooper-sekrit-very-very-serious-diary ugly. In all cases, the characters are little more than caricatures. The bad guys have tantrums and lie and mutter and practically twirl their moustaches. (In this book, even the women have moustaches. Evil moustaches.) And the good guys are beautiful and clever and insightful and bold and daring and righteous--but not so righteous that they're mean. Take the husband: an openly-gay major-league baseball player who cooks, cleans, does well with children, reads philosophy, skateboards like a pro, quotes literature, requires no special diet or food regimen, smells of cinnamon buns at all times, and throughout the book is accompanied by an elegant woman playing pleasing music on a harp which is simultaneously extravagant and modest. I really liked this book! It was a quick read and a page turner (for me). A good mystery and if you a liberal (like me) you will enjoy the story. It's is the first of Zubro's books I have read, and after this one I plan on reding more of his work. Possibly the last book in this series! Sad to see these characters go. Author also writes as: Mark Richard Zubro.